Children with learning disabilities often struggle to attend school in Ethiopia. A project supported by UK Aid Direct in Wollega, Western Ethiopia, is working to change this. 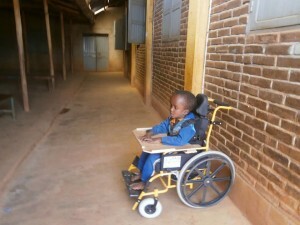 Exeter Ethiopia Link is currently running a 3-year project to improve accessibility and increase the number of disabled children who are able to go to school. Last year the project provided 122 people with assistive disability devices, such as wheelchairs. The project is operating within 150 schools and supports more than 3,000 children with disabilities. In addition to the project aim of increasing accessibility, it also works with parents and carers by establishing support groups to improve the quality of education that the children receive. In 2014 only 3% of children across Ethiopia progressed to preparatory school and outside of the capital city, Addis Ababa, only 28 young deaf people reached grade 11. In September 2015, the Exeter Ethiopia Link project helped to provide support for 7 young deaf people to pass their grade 10 exams. As a result of their successes, the students were accepted to preparatory school in Nekemte. The project has also given parents the opportunity to join a parent-support group that offers financial assistance to cover medication costs for their children, and school clubs have been set up in which disabled and able-bodied children participate together. In addition, the project provides training to teachers on how to support children with disabilities and make sure they are fully welcomed by others. The family of this child were delighted with the receipt of a wheelchair, enabling their child to access school for the first time.